For decades cars have used internal computers, but car companies have only trusted you with a miniscule amount of that data. 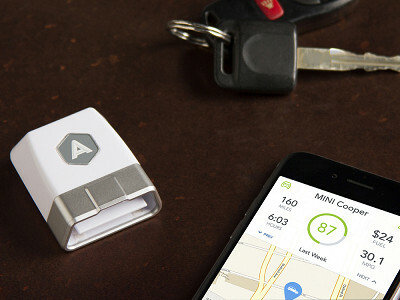 With Automatic you’ll have full access to data about your car, and your driving, right on your smartphone. Automatic connects to most cars built after 1996. It plugs into the same spot that mechanics use to diagnose your car’s engine and wirelessly connects to your smartphone. See whether that vague “check engine” light is a loose gas cap or something more serious—you’ll be a step ahead of your mechanic. But that’s really just the beginning of what Automatic can do. It maps every trip your car makes with incredible detail, including distance, time, miles per gallon, and even cost per mile. Automatic can also make you a better driver by scoring how efficiently you drive. It can even notify emergency services in the event of a crash. This “wearable for your car” is a driving companion that you'll be happy to have along for each ride. Its exciting to be launching our 2nd Generation Automatic Adapter on The Grommet. I’m looking forward to answering all your questions. Why is this something everyone should have in their car? Are their certain demographics you’ve seen particular success with? Having an Automatic adapter gives you the knowledge of what is happening with your car. This eliminates some of the mystery and stress of car ownership. Cars can be one of the most expensive products we own, we hope to make that experience better with Automatic. This product can help just about everyone. There are 250 Million used cars in the US with an average life of 11.5 years old. Some may need help with the check engine light, others may want the reassurance of crash alert. I have a college son that drives 8 hours each way through very rural areas. It's peace of mind for me that if he does crash, help will be on the way quickly or if the his check engine light comes on we know if he needs immediate mechanical help or not. For some, it's simply being able to manage the expense of gas. There are many Automatic owners that drive well over 20K miles per year and Automatic helps them save money on gas. @Mike Automatic has features that help just about everyone that owns a car. We have many current Automatic users that drive over 20,ooo miles a year and using Automatic helps them save money on gas. Being able to diagnose your check engine light before you go to the mechanic is valuable as well. No more surprises and it may simply be a loose gas cap you can correct yourself. The techie's love that they can connect their car to their other connected products like Nest, iWatch and Jawbone. I was drawn by the fact that it will actually tell you what is wrong when your check engine light comes on because I never know. Was there a lot of debate of what features to focus on in developing it? It was less of a debate and more about determining how we can provide information that is most meaningful and useful. There was and still discussion about how we can continue to help people get the most of out of their car and connect it to their digital life. This is such an incredible product with seemingly unlimited practicality. What was the inspiration behind it? Our cars are big computers with information that most of us didn’t have access to but can benefit from. Like being able to diagnose your own check engine light. This inspired the founders to create Automatic. They wanted people to have access to the valuable data hidden in their cars. If you are wondering if Automatic will work in your car, you can check here! @Mike Does this device connect to your smart-phone via wifi or bluetooth, in which case the phone must be in close proximity to the car, or does it connect via a cellular data signal? If it uses a cellular signal is there a monthly service fee? @JC The adapter connects to your phone via Bluetooth wireless. The phone needs to be in the car to connect and receive the data. There are no additional services fees to enjoy Automatic. @JC I don't have a smartphone but I do have an iPad … will this work with the iPad? This appears to be a godsend. Could we buy one for the household, or do you need to purchase a separate one for each car? @Jill Its optimal to have one per each vehicle. If you have multiple drivers in your household, they can all install the app and connect to Automatic adapter. You can also move the adapter from car to car. You simply need to follow the setup process when you install it into a different car. We have a 2016 Honda HR-V purchased in Mexico and resides in Mexico. Will your product work for us? @Thomas G Unfortunately, Automatic is only available in the United States right now. The reasons for this are multi-fold. Automatic was designed based on the 1996 OBD-II specification that was made mandatory by the Federal Government for all cars sold in the United States. While cars in other countries may also have OBD ports, they were not all manufactured under the same standard which means we can't be sure that Automatic will be compatible with those cars. Automatic uses many US-only data services like gas station locations and prices, emergency call center locations, and road data. Additionally, you will not currently be able to get through set-up on a car not manufactured to be sold in the United States as the adapter won't recognize your VIN. Automatic also only works with most cars sold in the US since 1996*. Different countries have different cars and standards for the port Automatic plugs into. Testing cars for compatibility and building support for them in the adapter is a major task and adding more cars would take a significant effort. So would complying with local laws and business practices, adding support for different languages on our website, in the app, and on our support team, etc. @JC - You say that the Automatic is only available for US cars, but yet in your video you show a number of references to a Mini Cooper (which is definitely not a US car). Which is it - available for cars manufactured in the US, or available for cars SOLD in the US? Hi Scott, as JC said, it works on cars manufactured to be sold in the US. @Mike - Any plans to include Canadian cars - as you know, US & Cdn auto manufacturing is highly integrated,. Hi Dean, it looks like the plan is to include Canadian cars in 2016. See JC's more detailed answer below! Hello. Would this device decode the error codes that the onboard computer kicks out? Or will it relay the error code? Automatic can read and interpret any generic "P" class OBD II code given by the car. We can also interpret generic codes in B, C, and U classes in cars that use these codes. I have been using a Bluetooth OBD-II adapter for about 18 months along with the Torque app. I am interested in transitioning to this device due to the integrated map function. Two questions. First, is there a potential for car battery drainage if the adapter is left connected all the time? I think the adapter is a small current draw that uses the battery even when the car is off. Second, in the event that I use your device and I find that it provides there same information that I currently ascertain through my adapter and Torque app, what is the return policy? Thank you for your help and information. When the ignition is off and the car has gone to sleep, Automatic consumes less than 5.5 mA from the battery. f a car battery is old/unhealthy, though, leaving the adapter plugged in could cause a battery to be drained if left plugged in without running the car for long periods of time. If you're unsure about your battery's health, unplugging your adapter while you're gone for multiple days, then plugging it back in before you start driving again is fine. We support Dash Command, Harry's Lap and OBD Fusion car performance apps with our 2nd generation adapter. Please review The Grommet's return policy: https://www.thegrommet.com/customer-service/returns for questions on returns. Just verifying that the device can handle extreme ranges of temperatures etc. ie how "durable" is this device. @JC So...what happens when it is out of temperature tolerance? Much of the country gets colder than -4 and hotter than 95. We certainly pass both ends here in Colorado. Does this stop working, does this become inaccurate, or does this die altogether? Hi Michael, JC updated these temps to range from -40 degrees F to 185 degrees F.
Hi - if we are considering replacing one of our cars. If we purchase this for one car, can we 'reset' it to work with another car? I think this is a great thing to have but am hesitant if I'm "locked in" to using it for one car if I get rid of the car in the near future. On that same thought, what if someone wants to use it when renting a car for business? Can the adapter be re-set to be used in various cars? @Susan Yes! You can use up to 5 cars with Automatic. Each car has its own trip timeline, parking location, and “check engine light” screen. To switch between your cars, just tap or swipe down on the car’s name at the top of the screen in the app. You can add additional cars, each with their own adapter, by tapping the Settings icon in the upper right-hand corner or by swiping left (iPhone only) and selecting “Set up another car...”. Then follow the Setup steps. You can also use this feature to permanently change which car your adapter is paired with. So if you buy a new car, choose “Set up another car...” and set it up with your existing adapter. Your old car’s trips will remain in your timeline unless you tap “Remove Car...” on the old car’s settings screen. Note that the adapter will only work with one car at a time so if you need to move it back to your old car or back and forth between cars, you’ll have to reconnect your adapter every time it’s moved. To reconnect, tap on the “Replace/Reconnect Adapter” link in the Settings menu of the app. Important note: if you move the adapter back and forth between multiple cars, please do not delete these cars from the app. Does it work with ford diesels? How many different autos can it be used in? Does this device provide a plain English, narrative or does it give you a code number that requires consulting a code book? If the latter, does a code book come with the device, and are all codes the same from vehicle to vehicle? And, one more... can the device be wired (e.g., with an extension cable or Blue Tooth technology, to provide a continuous readout of current operating levels, e.g., fuel mileage? @Carl Automatic can read and interpret any generic "P" class OBD II code given by the car. We can also interpret generic codes in B, C, and U classes in cars that use these codes. However, some cars also give manufacturer-specific codes in addition to generic codes. While we can *read* most manufacture-specific codes, we can't at this time *interpret* them. Our Generation II connects via Bluetooth and provides realtime data streaming. Understand that we don't want to promote distracted driving so our data only appears in your app after a trip is taken. An interesting looking produc. Is there any possibility that use will void any warrranty on newer cars still under warranty? I have one which is well beyond warranty that this would be a very useful addition to ffor ongoing maintenence. @K.A. I would check with your individual warranty to make 100% for certain, but it is unlikely that plugging something into your OBD-II port will affect your warranty. If that was the case, every time you took your car to the mechanic for a diagnostic would also void the warranty. Two questions. Will this device tell me just the error code number or will it translate that number to a car part and will it work on a Camry hybrid? @D Automatic can read and interpret any generic "P" class OBD II code given by the car. We can also interpret generic codes in B, C, and U classes in cars that use these codes. However, some cars also give manufacturer-specific codes in addition to generic codes. While we can *read* most manufacture-specific codes, we can't at this time *interpret* them. My "Check Engine" light is on all the time...will it work on a mobility conversion van. My vehicle is a Dodge Entervan. This looks very cool. What information can you see, besides fuel consumption, driving time and fuel costs, and can you see diagnostic information when the engine light is NOT on? @S L The app also provides your cars parked location and Automatic has a crash alert feature. If you are in a severe accident, emergency services are called. You can also designate up to 3 people in the app to be notified. In addition to our core app features, we also connect to other 3rd party applications. They include IFTTT, Rescue Time, Yo, Nest, Auto Dash, License +, Dash Command, OBD Fusion and more. Does this device connect to your smart-phone via wifi or bluetooth, in which case the phone must be in close proximity to the car, or does it connect via a cellular data signal? If it uses a cellular signal is there a monthly service fee? " @Mark Would you consider an app for Amazon's Kindle Fire line??? By that I mean from Amazon app store, as opposed to Apple, Google, etc. Hi Mark, JC answered your questions above! Lynn, I'm not sure that would work since a Kindle does not have Bluetooth capabilities at the moment. Kindle would need to catch up to Automatic! @Mike I believe you are mistaken...Kindle does ave Bluetooth capabilities. Hi Patricia, good catch. Some do. The Kindle Fire HD has the ability, but not the 2nd generation. Will the adapter work with an iPad? @JC To clarify Paula, we do not work with iPad. JC, thanks for brining this product to Grommet. What sets this device apart from other OBD II plug-ins/apps? I have used Bluetooth adapter ($10) with free apps on my phone, the SCANGUAGE II ($160), and currently pleased with the UltraGauge ($80). Is it possible to just buy the app and use an existing Bluetooth OBD II adapter? Thank you. @Stephen You are welcome Stephen, we are excited to be here! Besides all the great Automatic app features, our ability to connect to other 3rd party apps and also connected devices like Nest, iWatch and Jawbone make us unique to other products in the market. The app only works with our device right now. There's firmware on our hardware that is connected to the software in the app. The two are reliant on each other. @Bryan Our app comes free with the adapter. Most of the 3rd party apps we connect too are free but some do need to be purchased to use them. would this work for my 30' sailboat. Make one for boat systems and you'll be a millionaire! Check plumbing, pumps, watermaker, waterheater, lights, engine etc. Ahoy Karen! I don't think it will work unfortunately, but I will let JC confirm. It is certainly an option for Automatic to consider in the future! @Mike Mike is correct Karen, we only work with cars and our focus is helping drivers enhance their driving experience with connected services on the Automatic platform. I could have used this a couple of weeks ago. I had a check engine light that was going on & off for about a month and I finally took it into the dealer. Very costly $900 repair - they said it was the cellinoids from use of bad oil but the dealer was the one who always changed the oil. I'm still wondering what happened. The dealer was not very helpful and I've found this with several dealers lately. I'm very sorry to hear about that, Barbara! I hope Automatic helps you avoid any sort of similar situation in the future! the link to check your car isn't working. It is possible to choose a year but there are no makes or models in drop down and you can't type in anything. Hi Pam, you have to select the year first, then the make, and then the model. Have you had resistance from automakers? @Pam We have not experienced any resistance from automakers. I have a Ford Fusion Hybrid. Will this work with a Hybrid car? Hi Sam, check out the compatibility link up top to see if it works with your car! Can this be used by law enforcement in the event that your car is stolen? If so, how does someone go about letting the police know? @Wade If I understand your question correctly Wade, you are wondering if you can track your car if its been stolen or taken? 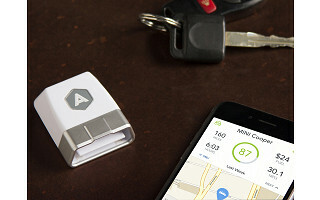 Automatic relies on your phone’s GPS at the end of a trip to capture your parking location. If the car is moved or taken by someone, the app is not able to detect the new location. When you complete a drive and turn off your car's ignition, the app captures the GPS location of your vehicle and then prominently displays it on the map in the app..
How "secure / personal" is the information transmitted from this device? Is the information limited to just one phone? Will others be able to track you? Hi Julius, Automatic uses bank-level encryption to protect your information. You can connect up to five cars on one device so you should be able to view other data of cars connected to it. Of course, I'll let JC confirm. @Mike As Mike mentions, we use industry-leading security practices (128-bit AES) encryption on all data transmitted from the car adapter to your phone and up to the cloud so your information can't be accessed maliciously. Ensuring your data is secure is one of the reasons we build our own hardware. Does this use power from the car battery? If so can you leave it plugged in when the car is off or will it drain the battery? Hi Heather, Automatic consumes less than 5.5 mA from the battery. If the battery is old or unhealthy it may pose problems, but taking it out if you're gone for multiple days and then plugging it back in when you get back is totally fine. How many units can you attach to a single smart phone? I have a fleet of vehicles for my business and I would love to track these items with your unit versus the more expensive units. Hi Jason, I believe JC said you can use up to 5 cars for each Automatic. @Mike To better clarify Jason, you can have 5 cars per adapter and up to 7 cars per person set up. In order to see the information for all vehicles you would need access to the users dashboards since generally each user has their own profile. Every user with that car registered to their Automatic account will have their own trips recorded in a timeline when they drive, see where the car is parked (no matter who drove it), and see “check engine” light issues in the app when they occur. If you share an account with another person, have multiple adapters installed in multiple cars, and both of you drive at the same time (in separate cars), you will experience trip capture and connectivity problems. For this reason, we recommend that each driver have his/her own Automatic account in this configuration. Hi J J, you can check via the compatibility link above. Wondering if this would work with a 2003 or 2005 Chevy Silverado (yes we have both) and would it work with an iPad? our iPhones are pretty old. 2. What is return policy? Hi Susan, Automatic consumes less than 5.5 mA from the battery when your car is off. It will only pose problems if your battery is old or unhealthy. If you are ever gone for a few days or more, you can unplug it and then plug it back it when you get back without an issue. Automatic's return policy is a money-back guarantee within 45 days of purchase! Will this diagnose a check engine light if you plug it into your car after the light goes on? Or does it have to be plugged in at the time the check engine light goes on? What about other alerts like a brake light alert? @R I have a 1997 Volvo 850T wagaon and it has a service light that needs reset. Can this device reset a service reminder light? This isn't a CEL (check engine light). Automatic is diagnosing the CEL so we do not have the ability to reset the service light. @R It will diagnose after the CEL goes on. Automatic diagnoses Check Engine Light only. I have a 1997 Volvo 850T wagaon and it has a service light that needs reset. Can this device reset a service reminder light? This isn't a CEL (check engine light). Does your app collect or share my data? If I have the adapter plugged in can someone else hack into my data? What security measures have you taken? Thank you! @Angie Security is at our core. Here are our Privacy Principles. Our autos are insured with Progressive and they have the same device, Drive Wise, to insert into the same diagnostic port as the Automatic plugs into. How would this work if we need to keep the Drive Wise device plugged in for a diagnostic read of our driving habits. Thank you. You can only have 1 device plugged in the your OBD II port, therefore our device could not be installed if you have the Drive Wise installed. Can we switch from one car to another as we choose? Yes, you can Peter. You can set-up 5 cars per Automatic! There *are* some folks who are using Automatic outside the U.S. However, if your car was not manufactured to be sold in the U.S., you will likely get stuck at the VIN recognition portion of set-up. Also, because we don't officially support usage in other countries, we can't know for sure whether or not Automatic will even work on your car and we can't provide technical support if you decide to use it anyway. Many of the features will work but units are not metric, fuel prices are U.S. only and Crash Alert only works in the U.S.
We are planning on expanding outside the US in 2016. Can I use the device to program my remotes? @James No, Automatic can not program your remotes. The adapter should work with an extension, though, because we don't manufacture our own extension cables, we can't guarantee 100% that it will function properly. Also, we have no way of ensuring that Crash Alert will function with an extension cable. can this be used on two or more cars and what about when you buy a different car can it be switched to the new car? Yes it can, Dairel! You can register up to 5 vehicles with Automatic. Is the information captured saved in any format within your organization? We collect information about your vehicle’s operation to provide you with feedback on your driving habits. For example, we collect data on hard braking, hard acceleration, and speed. Using this information, we provide you with insight into your driving style that can help you save on gas and vehicle wear and tear. We request your vehicle identification number so that we can provide you with more precise feedback based on your specific vehicle submodel. Just to be sure, I have an ipod Touch with bluetooth, so it can communicate with the Automatic Adapter. I am wondering if this device can connect to a mini iPad. Hi Pam, unfortunately Automatic doesn't support iPad. I can foresee how much this will help people who, like myself, are not under-the-hood savvy. So many times (hopefully less than it used to be) we hear of how dishonest mechanics take advantage of that fact and overbill or even make up a problem that really isn't there. THANK YOU!! @Lori You are welcome Lori! It is really nice to have that confidence before you go to the mechanic. Is there now a means to, or near future plans to, enable this device to store "driving style" for later retrieval. It is understood that the trip routing would not be available as it doesn't have an independant GPS. Asking exclusively about being able to store (by default without BT connectivity perhaps) accelerometer data. i guess my primary concern would be privacy. The information about my locations is obviously stored somewhere; this seems like a prime target for those looking to rob houses while people are gone to work or some type of other similar situation. Is Automatic knowing my whereabouts just a concern that I either just have to deal with or choose not to use the product? Hi Ryan, Automatic utilizes bank-level encryption for security and as JC mentioned above, Automatic can't be used as a tracker so the scenario you used shouldn't be a concern! 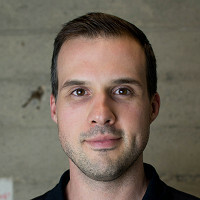 @ryan We couldn't agree more about the importance of privacy and take it very seriously at Automatic. Please see my note above to Angie and Jim. We recognize the trust you place in us and don't take it for granted. Is this available in Canada? My husband works on multiple cars, would this work in that fashion? Or only for one vehicle? We currently support cars made for use in the U.S. There *are* some folks who are using Automatic outside the U.S.
We live in Northern Saskatchewan, Canada. We have usually a two week window of -40 (same in F & C) Can your product handle that? It is exactly what we have been looking for. Not at the moment, David! The current cold tolerance is -20. As they continue to develop the product especially in the Canadian market, they could increase the tolerance. Actually David, JC clarified to say it could handle -40 degree temps! I don't see 2000 Chevy Trailblazer, so is this vehicle not compatible? @Cyndi We are working on a solution to add your vehicle. We hope to have it available soon. Please check back in a few weeks. Can this be transferred to a new car? Yes it can, Cathryn! You can set-up five vehicles per Automatic. Is there a list of vehicles that the Automatic works with? Will it work with a Isuzu NPR Medium duty truck? Hi Steve, there is a link at the top of the page that will tell you if your car is compatible. This looks to be nothing more than an OBD reader which can be had for 23.00. Coupled with the paid TORQUE app ($5), will give you all the same info. Additionally, if it does not have an On/Off switch and you go on Vacation for 2/3 weeks, your car may be dead on return. Looks can be deceiving, Joseph! It does look like an OBD reader and it provides the functions that an OBD reader does, but it also provides detailed data on your car's miles per gallon, an analysis of your driving efficiency, and notifies your emergency contacts in the event of an accident. It does all of this with bank-level encryption and a FREE app. If you do happen to go on vacation, just take Automatic out before you leave, put it back when you return and you'll have no issues! @Mike In addition to the great features Mike points out, we also connect your car to other digital devices like Nest, iWatch and Jawbone. With IFFTTT you can create powerful connections between Automatic and many other devices and digital services across the web. Some of our favorite Recipes are opening a navigation app at the start of a trip, making Wifi connected lights flash red when you speed, or shutting the garage door when I get home.There are hundreds of pre-made Recipes to choose from and you can even make your own! Trigger dozens of popular services like Twitter, Dropbox, Google Spreadsheets, and more, as well as devices like Philips Hue lights, Garageio, and Dropcam. Does it only send information from the computer if the "Check Engine" light comes on or does it register all information the computer sends out? Hi Paula, it registers all info the computer sends out! @Paula For diagnostic purposes, Automatic is helping you with the Check Engine light indicator in your car. 'Our goal is to make sure you're informed about what the Code indicates so you can be knowledgable when you speak to your mechanic. A reading of a CEL trouble code can be confusing because the trouble code is only one piece of information, a single symptom of a possibly larger problem. Imagine going to WebMD with a headache, and trying to figure out what it means – a headache can mean anything! If it’s bad enough, you probably need to go see a doctor. This is the same for your car. Engine codes should be diagnosed by a professional, but identifying and understanding the symptoms can help you be comfortable talking with your mechanic. Some people like to continually clear the light and put off checking in with a mechanic. This isn’t your best bet because ignoring the problem might make it worse – sometimes substantially. Does this gadget tell you any other problems besides just the "check engine" light? Or are all the problems under the umbrella of "check engine?" This item would be a God Send for my son-in-law who has a 36 foot boat that won't cooperate while out on the open sea. With this device he would know exactly what was going wrong and why. I'll be the first to purchase it for him when/if you ever launch it for boats. Thanks for your innovation! Good to know, Eleanor, thanks for the comment! It sounds like you and Karen will have a race to see who can get the boat version first! So can this device be used on Cars made in Canada? Just so I know before I order this product. Car support outside of the U.S. is not guaranteed. We currently support cars made for use in the U.S. There *are* some folks who are using Automatic outside the U.S.
Can I reset the trouble light? @Clement I believe you are asking about the CEL (check engine light)? If so, yes, you can reset the CEL but if the actual issue reported is not fixed the the light will reappear. Is there one made for 1994 Jeep Cherokee... mine is driving us nuts !! Automatic uses the OBD-II standard that is available on cars made since January 1, 1996. This is the same 'standard' port mechanics use to diagnose CEL issues. Some manufacturers started incorporating OBD-II in various models as early as 1994 but they were not necessarily compliant. Can you respond to the question asked previously about what happens if you are outside of the approved temperature zone? I live in Chicago and our winters are colder than -4 F while our summers get above 95 F. Seems like this may not work well in the Chicago area?? I apologize for the confusion. We've got you covered! One of your responses indicate a temperature range of -4 to +95 degrees F. Elsewhere it says it will operate to -20 degrees. I live in SW Colorado where temperatures can sometimes dip below -20 F. This is usually (but not necessarily) for short periods of time. So as a practical matter, what does this mean. Would I have to remove the device in anticipation of low temps? Will the car have to warm back up before it will operate accurately? Will leaving it in during low temps permanently damage the device? Can you clairify this for me? I spend a lot of time in Minnesota were it gets really, really cold and my Automatic works like a champ year round. I'm still confused about the data you store & what it is used for. In posts above, you mention that during transmission data is encrypted. Is this with both Bluetooth and internet to the app? Also, is data stored encrypted where nobody but me or my app has access to it - including the folks at Automatic? Since there is identifiable information such as my VIN, I am extremely concerned who can see my driving habits. Thanks! Hi Louie, the data is stored for you so that you may analyze your driving efficiency amongst other data points. All data is secured with bank level encryption where only you and those you share the device with can see it. Rest assured, your information staying secure was at the top of Automatic's priority list. This is from our Privacy Principles and should help answer your questions. We take privacy very seriously, and we do not share your data with anyone outside our company. We also would never share personally identifiable information with third parties unless it was in the capacity of a program that benefited the user AND was user opt-in. In terms of security, all data sent from the adapter to your phone is done with bank-level AES encryption. Once you set up the adapter with your phone, no one except you can communicate with the device. Second, the data sent from your phone to our servers is also encrypted, where it resides within our secured cloud-based network. Automatic engineers and other personnel have supervised access to your information so that we can provide Services to you and help you if you contact us for support. Theoretically Tommyboy, as long as you use it for just that car you will be able to track it all. I don't think it will be able to do your tax reporting for you unfortunately. Yes! This is one of my favorite features @tommyboy. You can identify specific trips as business trips in the app (or on your Automatic iWatch app) and then download them from your web dashboard into a file for tax purposes or expense reporting. Automatic is also integrated with several business apps like Expensify and Concur so you can streamline your car mileage reporting. @Tommyboy I took the time to read all comments above and see that no one asked this question. If provides a years worth of data for use in taxes, I am ready to buy two! @Tommyboy Nice! Very nice indeed. My order for two is on its way. I'll ask my kids if they want one also which would push the order for 4! I stand corrected! Thanks for the info, JC! @Tommyboy The web dashboard is really remarkable as it not only captures your driven miles for the year and all time, you can also sort by certain date ranges, distance traveled, duration of a trip, fuel cost, and time of day. I don't have a smartphone but I do have an Apple Itouch using iOS 9.1 will it work with that? @sally The Automatic app works only with Android or iOS Smartphones, not iTouch or iPad devices. My husband and I bought three; my car, his car and our son's car. My son has a 2005 small truck, his automatic worked for about month and then stopped reporting. My husband had a new honda Accord, his reported and then stopped after about 6 months. MI have a 2014 Toyota Highlander, it stopped reporting after 10 months. I am soooo disappointed. It was great at first, but come on three out of three. I would not buy again, not would I recommend it to my friends. @Annette I'm sorry to learn your experience with Automatic was disappointing. I would encourage you to reach out to [email protected] so we can help resolve any issues you are encountering. We refer to them as Wizards because they are amazing at solving problems. I have a LG G4 cell phone, is this Diagnostic compatible with my phone? Yes, with Android 4.0+ OS. I have one of the original versions of Automatic and like it. What is the difference with v2.0? @Ed Glad you like your Automatic Ed. The 2nd Generation provides realtime Bluetooth streaming so you can use performance apps like Dash Command and OBD Fusion. It also has a dedicated GPS module which helps assist the app in route determination and helps to capture up to 8 hours of trips in the event you don't have your phone in the car The next time you do have your phone, the trips will upload. Lastly most diesel cars are now supported. Is there a monthly fee or requirement to use a certain cell company? No additional fees required or to use certain cell companies. The app uses a small amount of data, around 10-15MB per month. Our app comes free with the adapter but some of the 3rd party apps may not be free (most are). Does this work with Samsung Galaxy phones? Yes, with Android 4.o+ OS. For decades cars have used internal computers, but car companies have only trusted you with a miniscule amount of that data. With Automatic you’ll have full access to data about your car, and your driving, right on your smartphone. Automatic connects to most cars built after 1996. It plugs into the same spot that mechanics use to diagnose your car’s engine and wirelessly connects to your smartphone. See whether that vague “check engine” light is a loose gas cap or something more serious—you’ll be a step ahead of your mechanic. But that’s really just the beginning of what Automatic can do. It maps every trip your car makes with incredible detail, including distance, time, miles per gallon, and even cost per mile.